NOTICE to all customers: Please notify K.S. Choi Corp – your seller- directly and immediately for any issues with the extension tubes. We will send you a replacement extension tube for all tubes deemed faulty within 30 days from the date of purchase. 19 x Plastic Cupping Cups (Premium Quality, 13 of the 2″ dia cups, 1 of the 1.8″, 2 of the 1.6″, 2 of the 1.3″, and 1 of the 1.1″ dia cups), 1 x Hand Pump, 1 x extension tube (optional), 1 x Carrying Case (Professional Look). 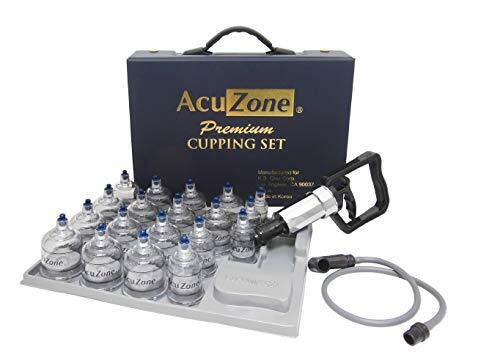 Acuzone Cupping Sets are used by 2016 Rio Olympic Athletes Magnificent quality plastic cups with shockproof & heatproof that can be sterilized with boiling water. It is the finest baby bottle plastic material used for strong, clean, and leaves no marks and scratches easy.